Dr Loh Cheng carefully attends to a villager in a rural area in Yunnan, China. When Dr Loh Cheng’s Yunnan colleagues and friends speak to him in their local dialect, he considers it a fantastic compliment. “It is good to know that after all these years, I am perceived as no different from the locals, in that I can fit in. I’m flattered they consider me one of their own,” says Dr Loh, who has been living in China with his wife and three daughters since 2008. The general practitioner is involved in a slew of healthcare programmes to improve the standard of medical care in the province. One is a three-year collaborative project that connects the Singapore International Foundation, the National University Health System Singapore and Saint Luke’s Hospital Singapore with the Second Affiliated Hospital of Kunming Medical University and the Yunnan Health and Development Research Association. The project aims to promote learning between the two countries on quality rehabilitation care for the elderly. 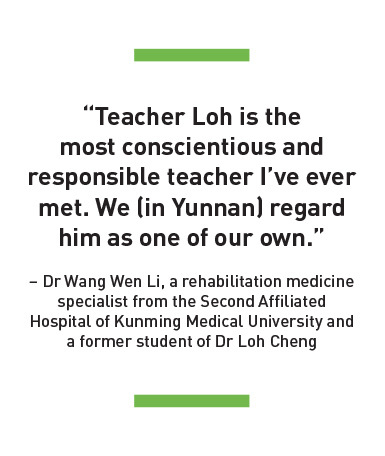 Dr Loh, 41, played a crucial role in connecting the Singapore and Yunnan partners, helping them understand one another and giving their best to train Yunnan’s healthcare professionals. As an educator of Chinese clinicians in Kunming, Dr Loh teaches and trains his Chinese counterparts in medical care. Despite being the only Singaporean working on the project, his peers do not see him as a foreigner. His rapport, trust and influence built with the local communities enable him to extend his work to rural villages. Dr Loh also furthers the work of his Singaporean predecessor, medical volunteer pioneer Dr Tan Lai Yong, who enabled better access to medical care in these areas for 15 years before moving back to Singapore in 2010. Dr Tan had introduced him to an invaluable network of people and organisations in Kunming, and Dr Loh has continued to build on those connections and the goodwill. Dr Loh’s eight years of service in China have set off a ripple effect, inspiring the Chinese doctors and medical workers he has trained to start their own humanitarian efforts. government efforts to expose civil servants to grassroots needs and contexts. He has also heard of Chinese doctors in big cities, such as Shanghai, who volunteer in rural communities in Yunnan. He finds these examples encouraging, as many city dwellers prefer not to leave the comforts of cosmopolitan life to serve in villages.